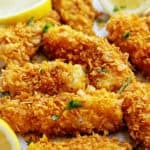 Crispy Baked Fish Sticks Recipe – A delicious and much healthier spin on the classic fish sticks you remember as a kid! Preheat oven to 400° and cover baking sheet with parchment paper and spray liberally with non-stick cooking spray. In a shallow bowl, whisk together corn flakes, paprika, lemon pepper, salt and cayenne until combined then place flour and egg in two separate shallow bowls. To assemble, dip fish in flour to coat both sides then dip into eggs and finally into cornflake mixture then place on baking sheet. Once done coating all fish, liberally spray tops of fish with additional cooking spray. Bake 12-14 minutes or until fish just begins to flake easily with a fork.